We were meant to go to Santa Barbara for winter break, but our plans fell through, and at the last minute, we were scrambling for a place to go, that didn't involve booking a flight. I started looking at lots of hotels with indoor pools, in beautiful locations or interesting cities, within a day's drive from New York. I found alot, and am going to document them all here (not all in this post--I'll spread them out)...As I've said before, as long as there's a pool, and good food, we are happy. I love the look of this deco pool, at the Fairmont Chateau Laurier, in Ottawa. Another place we have been to, and love, and isn't quite as far as Ottawa, is the Omni Bedford Springs, in Pennsylvania. It's about 4 1/2 hours from NYC, and has an indoor pool that uses their mineral springs water. I believe this was the first indoor pool in the country. I'll do a post about later this week, when I have access to all of my pictures. Right now we're in Binghamton, visiting Grandma, and I'm without wireless. We're driving to Quebec today, to stay at the Chateau Montebello, which looks amazing. I'll report back on Tuesday. Sounds like a pretty amazing place. 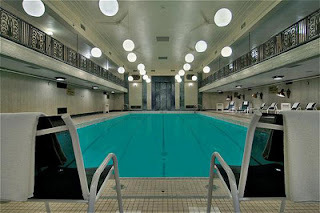 Is the indoor pool mentioned built like that lap pool in the picture?